Carr Lane Roemheld power working devices allow users faster clamping and faster machining without sacrificing quality. Power workholding devices offer significant advantages over manual clamping, including remote clamp operation, reduced operator fatigue, automatic sequencing, compactness and increased machine-tool capacity. Hydraulic workholding solutions from Carr Lane Roemheld include Swing Clamps, Extending Clamps, Threaded Cylinders, Block Cylinders, Power Work Supports, Fixture Clamps, Vises, Hydraulic power sources & valves as well as a full line of fittings and accessories. 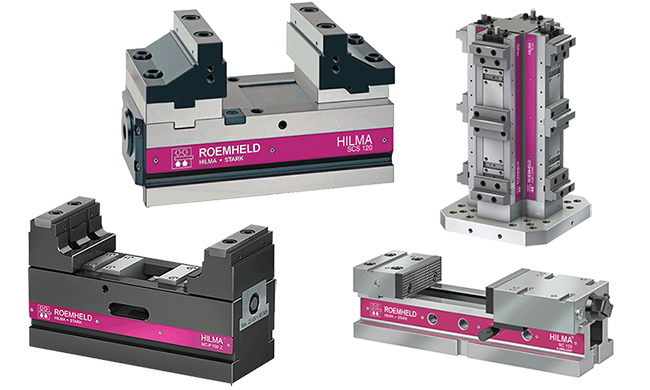 Carr Lane Roemheld and Hilma concentric clamping and workholding vise products include the MCP-Series, SCS Series and NC Series. The MCP-Series includes 5-Axis, concentric and flexible workholding vises, which allow for unrestricted tool access for multiple-side machining. Roemheld’s swing clamps come in 5 varieties including mini, compact, standard, robust, and air powered. We also offer a variety of swing clamp accessories. Each swing clamp type has a variety of different clamps to meet your machining needs. Browse our large variety of swing clamps here. Roemheld’s extending clamps have a sturdy lever mechanism that pivots into clamping position. Our extending clamps are available in a variety of clamps including compact clamps, hinge clamps, slide pivot clamps, flat clamps, block extending clamps, and low-block edge clamps. Each category of clamp has the sizes and finishes to fit your machining needs. Roemheld has a large selection of threaded cylinders. All cylinders come in a wide range of sizes with mounting and fluid supply options. Each threaded insert is manufactured with steel and has a black oxide finish. Browse our large selection of threaded cylinders below.